Parking lots aren’t usually very interesting. And, as I found out this morning, it’s rather difficult to take an interesting photograph if your subject happens to be that parking lot. And, usually, when one dives into the history of a parking lot, you find, as its predecessor, an open field, a burnt-out residence, or maybe a poorly constructed building that just outlived its usefulness. 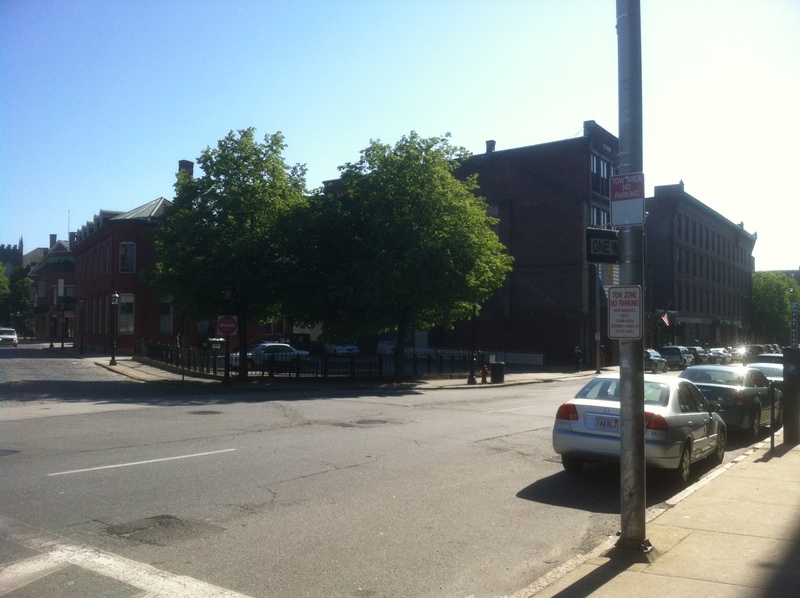 There’s a parking lot in downtown Lowell with a much more interesting history, though. It’s framed by the intersection of Shattuck and Market Streets and is adjacent to Lowell’s Athenian Corner Restaurant. The lot’s days for parking can be traced back, rather precisely, to the first days of September 1933, when a rather nostalgic downtown Lowell community bade its farewell to a building that dated to Lowell’s very first days as a city. Since the start of its construction in 1837, the building first served Lowell as a church, then as a theatre, later as a boxing ring, and ultimately as a warehouse for one of its leading department stores. All of those incarnations were recalled fondly as the wrecking ball came for the building in September 1933. 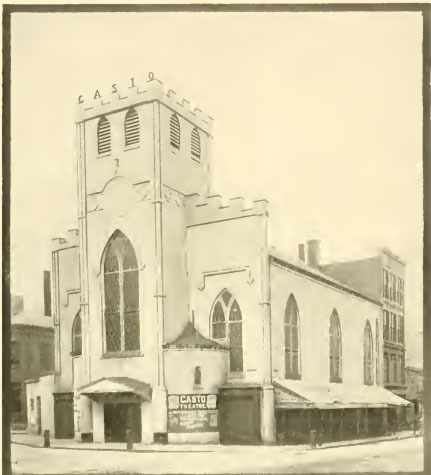 Lowell’s Casto Theatre, as it appeared around 1903. (Source: Views of Lowell and Vicinity). Located at the corner of Downtown Lowell’s Shattuck and Market Streets, the dark brick building directly behind it now houses the Athenian Corner Restaurant. At the time of its demolition, the building’s past was best recalled by the time it was known as the Hathaway Theatre, a name it carried some 25 years before, from 1905 to 1912. It was also well-known as the Casto Theatre. But the building had many names during its century of existence. Throughout its many years at the intersection of Shattuck and Market Streets, the building’s architecture proclaimed its origins as a religious institution. Indeed, the building was first dedicated as the Second Universalist Church on November 15, 1838. The building remained the Second Universalist Church for years, nearly 50, before it changed its name to the Shattuck Street Universalist Church in 1888. By 1892, church leadership began talk of selling the church property and relocating to a ‘more desirable’ part of town. And, the following year, the Shattuck Street Universalist Society changed its name to Grace Universalist and purchased a lot on the corner of Lowell’s South Canton Street and Princeton Boulevard. As the new church went up, church leadership worked out a deal with prospective buyers that would lead to the opening of the Savoy Theatre. As the Savoy prepared to move into the old church, the first stone of the Society’s new church was laid on April 11, 1895. 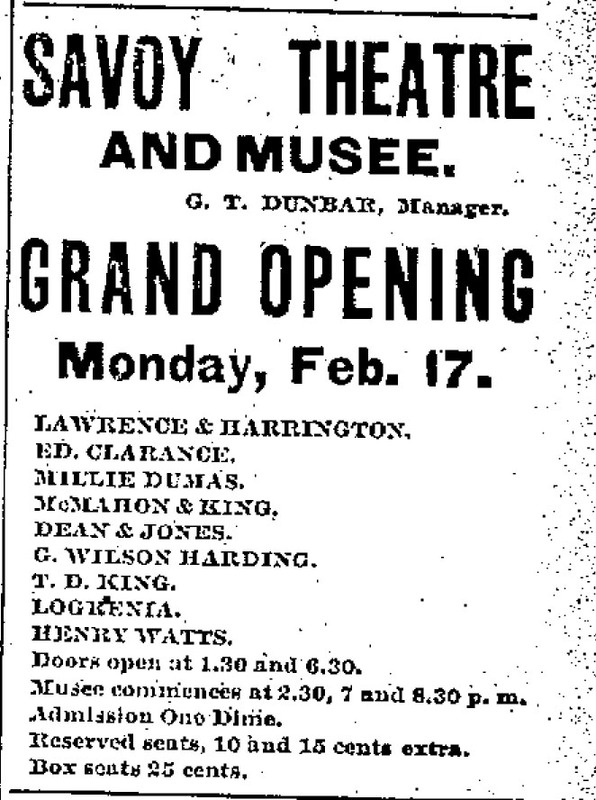 The Savoy Theatre and Musee opened on February 17, 1896 as a vaudeville house. The novelty of converting a church to a theatre was not lost on the Lowell populace. As the scheduled opening of 2:30 PM approached that day, thousands lined Market and Shattuck Streets awaiting the new theatre. And, it was by no means certain that the Savoy would open. Mr. White, the state inspector of buildings had already condemned the former church once as unfit for theatrical purposes. Those downtown on the day of the Savoy’s scheduled opening prepared for quite a spectacle as Mr. White arrived, at 2 PM, and met with the theatre’s management. Ultimately, he did allow the doors to open at the scheduled time of 2:30. So large was the crowd that many had to be turned away. Among those who arrived to the theatre’s opening were members of the former church, anxious to see the ‘grand transformation’ of their building. That first show, in the converted church, promised some of the biggest names of the day in vaudeville. And reports exist proclaiming the show’s grandeur. They also record that the audience was timid in applauding in a church. Or perhaps it wasn’t just that they were timid. Those same reports recorded lots of issues with stage mechanics as the theatre worked out its ‘opening kinks’. The Savoy gained some early notoriety when it found Miss Mamie Russell and her ‘Slide for Life’ act in early April 1896. Her show, one of the Savoy’s most popular, featured Miss Russell sliding 400 feet, from the top of the theatre to the ground in front of the nearby YMCA building. Despite the excitement surrounding its opening, the theatre soon ran into the red. Management promised a change in the theatre’s “policy” and used advertising to proclaim that they were doing away with the “curio hall” attractions. They promised “high-class vaudeville talent” only. Similar promises, and a succession of managers, came and went over the next few years, each bringing a new policy or approach. None were successful in making the Savoy a profitable enterprise. Yet another new manager promised another new policy on March 26, 1897. However, before the month was out, the theatre closed. The Savoy stayed dark for about a year, before it reopened in February 1898, this time devoted exclusively to vaudeville. A few short weeks later, the Savoy closed again, this time until December. As part of this re-opening, the Savoy changed its name to the Casino – for about four months, before changing its name back to the Savoy in March 1899. The openings and closings of the Savoy continued, with a re-opening in September 1900, and another in October 1902, this time as the Casto. 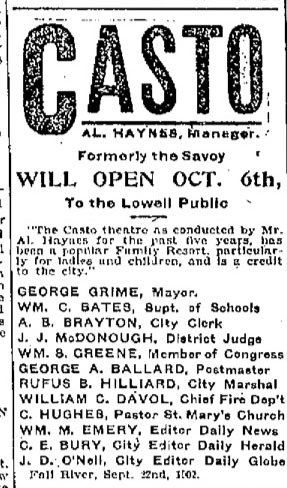 Al Haynes managed the Casto during those years, and had brought the theatre’s new name from Fall River, where he had made his name. The Casto made headlines in January 1905, though whether it was the lollipops it gifted to patrons (the latest craze) or Miss May Belfort, an English star who attracted much attention, was not certain. Just a few short months later, the Casto underwent another ‘grand opening’ and another new manager. A newly hired company of actors and a newly appointed stage promised a much enhanced show. It must have worked – maybe even a little too well. 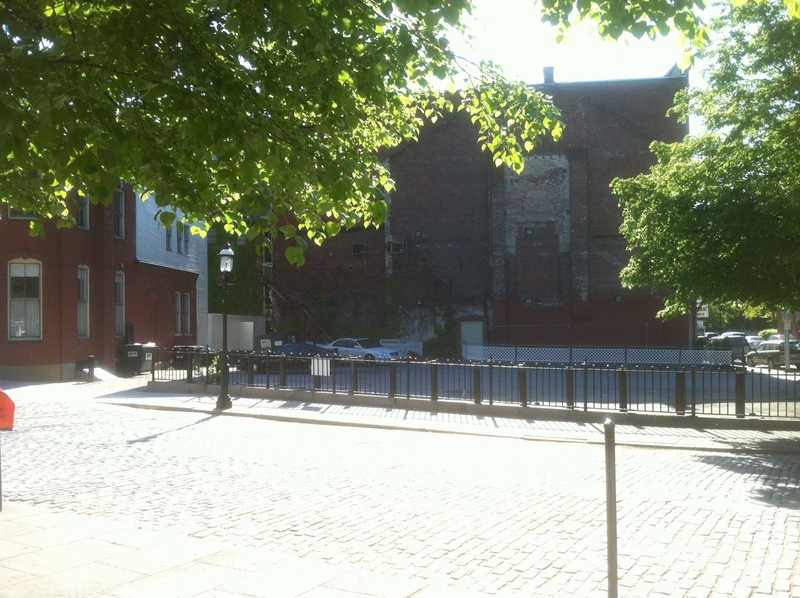 The actors left the Casto within a few weeks and moved on to its more prominent competitor, the Lowell Opera House. Casto management replaced them, but attendance waned, and, by Christmas Day, 1905, the Casto became the Hathaway. The theatre’s new owner, Andrew Hathaway tried to resurrect a theatre that locals had begun to call the “white elephant’. His program promised ‘refined acts of vaudeville’, and ‘the best the market had to offer’. And, for a while, the Hathaway succeeded and became known as one of the region’s best houses of vaudeville. By March 5, 1912, however, the Hathaway had followed its predecessors into financial hard times. A newspaper article of the time announced that it had again closed its doors. The theatre had been showing some of the day’s most popular shows, like ‘The Preacher and the Convict’. Theatre management blamed the Lenten season for sluggish ticket sales. Six months later, on September 16, 1912, the Hathaway became the Playhouse Theatre and Kendall Weston became its manager. Weston had a long history with the location and had been connected to the Savoy. 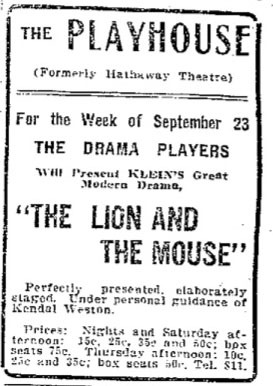 He brought in an acting company known as the “Drama Players”, who performed such period favorites as ‘The Lion and the Mouse’ and ‘The Charity Ball’. Weston also acted in some of the plays. After some initial success, the Playhouse Theatre opened and closed, frequently, as well. The theatre temporarily tried its hand at burlesque in March 1914, adopting it as its policy one week, and shedding it in favor of showing ‘moving pictures’ the next. On March 29, 1914, the headlines promised that the Playhouse would show ‘the $40,000 five reel feature film sensation, ‘The Making of an Automobile Shown by Vivid Moving Pictures’. The Playhouse fell quiet again after that. Lowell High put on its annual play there. The Middlesex Women’s Club showed children’s movies there for a time. After that, the Lowell Orchestral Society offered concerts there. Movies came back for a while in March 1917. The following month, the Playhouse made another go at showing burlesque and musical comedy. This continued, through more openings, closing, and reinventions. New movie houses like the Strand moved into Lowell, and the more influential Lowell Opera House began to corner the shrinking market for live shows. The Playhouse eventually closed for good, in 1918, and opened only sporadically in 1919 to serve as a boxing ring for local boxing stars. On August 7, 1919, on the same day the Lowell City Council expressed its support for Irish independence and invited Ireland’s Eammon De Valera to Lowell, the announcement came that the Playhouse had been sold to the Chalifoux Company for use as a warehouse and garage. Fourteen years later, the building was demolished and replaced by a parking lot, which still exists at the site today. Thanks Mike! I’m working on a few more Lowell ideas now and hope to have them up soon. I love these too, Ryan. Never thought a parking lot would have so much history! I was surprised too, Karen. The lot’s been there for years, but I never gave a thought to what once might have occupied the spot.